Let me begin by first wishing you a wonderful Sunday with your family and friends. 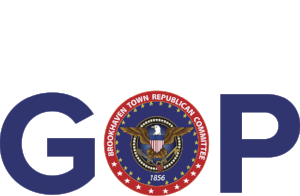 On behalf of our Elected Officials and Party, I cannot THANK YOU enough for your support of the Brookhaven Town Republican Committee’s 2019 Campaign Launch Party on January 24th! This spectacular event not only celebrated our HUGE wins at the Ballot Box in 2018, it also served as the Launch of our Victories to come this November for our Brookhaven Republican Officials. Your support means so much to me and all of our Town, State, County and Federal candidates as they work every day to serve YOU, and the ideals and beliefs we all share. As we enjoy the start of a new year, one with such promise for prosperity, I want to once again offer you my personal THANKS for making our event a resounding success. I look forward to our continued friendship as we join our Republican candidates on the field of electoral battle for another year of Brookhaven Town Republican Party Victories on Election Day. Wishing you and your family a year of happiness and prosperity.